Passover is when we tell our collective story as a people. Nearly all Jews celebrate, in some form or another, the Passover Seder. As such, it is an incredible opportunity to provide inspirational content to help facilitate Jews to find a meaningful connection to the larger story of their people. Despite the popularity of the holiday and companion Haggadahs, there are little to no Haggadahs that are geared specifically for teens and young adults. Many Haggadahs are made for young children and there is a huge selection for learned adults, but a Haggadah geared both in content and style to a millennial audience still seems to be lacking. Enter the NCSY Haggdah. 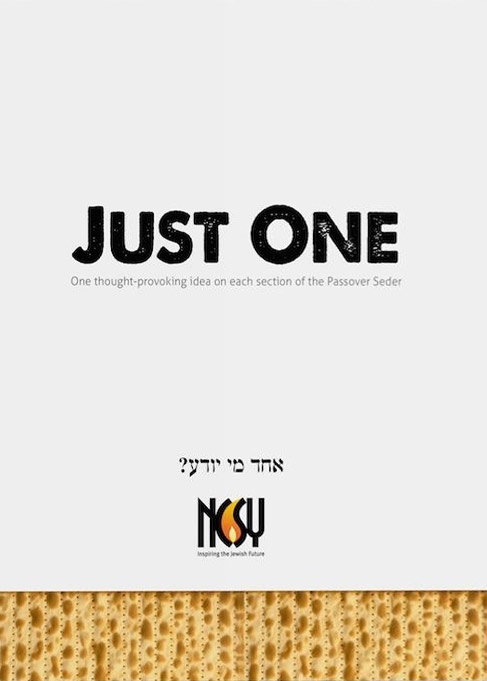 Known as The NCSY "Just One" Haggadah, it was designed with a captivating layout and moving graphics -- accompanied by one powerful and resonant idea on each section of the Seder. No more, will you be turning pages just to finish the third long idea running through the commentary on the bottom of the page. 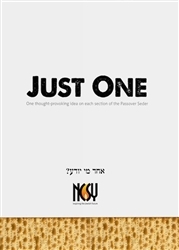 This Haggadah was designed with a clear focus on "just one" idea, making each page and moment in the Seder come alive. This Haggadah is perfect for a teen, college student, or any family that wants fresh new ideas to inspire their Passover experience. The NCSY Just One Haggadah is just the one for you.